The comments came on the same day as the OSCE (Organization for Security and Cooperation in Europe) stressed that progress in the fulfillment of the Minsk peace deal between Ukrainian government and the militias in Donetsk and Lugansk Regions. Spokesman for the OSCE Special Monitoring Mission in Ukraine, Michael Bociurkiw, described a decline of ceasefire violations and withdrawal of heavy weaponry by both sides in the conflict. German authorities were “alarmed” by the stance of the NATO commander and wondered whether “the Americans [are] trying to thwart European efforts at mediation led by Chancellor Angela Merkel?”Der Spiegel wrote. According to the weekly, it is not the first time the German authorities are “alarmed” by the US general’s statements on the Ukrainian conflict as his numbers of alleged Russian presence in Donetsk and Lugansk have always been significantly higher than those available to European members of NATO. Now, the German Chancellery “simply shake their heads” each time Breedlove makes comments on Ukraine, Der Spiegel said. “False claims and exaggerated accounts, warned a top German official during a recent meeting on Ukraine, have put NATO – and by extension, the entire West – in danger of losing its credibility,” the paper wrote. It “remains a riddle until today,” how he jumped to such conclusions, one intelligence agent told the weekly. “The German intelligence services generally appraise the threat level much more cautiously than the Americans do,” an international military expert in Kiev said, as cited by Der Spiegel. 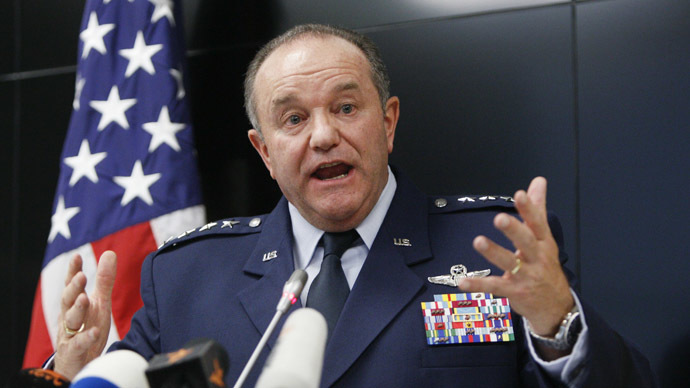 The magazine drew several more examples of General Breedlove’s “slips of the tongue,” including one he dropped at the beginning of the crisis; Breedlove said that Russians allegedly gathered 40,000 troops on the Ukrainian border and the situation was “incredibly concerning” as they were preparing for an invasion. “There weren’t 40,000 soldiers on the border, they believed, rather there were much less than 30,000 and perhaps even fewer than 20,000. Furthermore, most of the military equipment had not been brought to the border for a possible invasion, but had already been there prior to the beginning of the conflict. Furthermore, there was no evidence of logistical preparation for an invasion, such as a field headquarters,” Der Spiegel wrote. The NATO commander also made “inexact, contradictory or even flat-out inaccurate statements,” the sources said. The two are “doing what they can to pave the way for weapons deliveries,” the magazine wrote. She also famously said “F*ck the EU” in a leaked phone call, in which she discussed the future composition of the Ukrainian government during Maidan riots in Kiev. The German FM’s statement on the same day as the EU’s Foreign Policy Chief, Federica Mogherini, stressed that the European has a realistic view of Russian events, but it “will never be trapped or forced or pushed or pulled into a confrontative [sic] attitude” towards Moscow. The Ukrainian government and the rebels in the south-east of the country struck a peace deal in Belarusian capital Minsk on February 12 after almost a year of fighting. The signing happened with active mediation from Germany and its ‘Normandy Four’ partners – Russia and France. The Ukrainian conflict began in April 2014, after Kiev sent its military to the south eastern regions, in which people refused to recognize the new coup-imposed authorities in the capital. The fighting has seen over 6,000 killed and nearly 15,000 injured, the UN Human Rights Office said last week.